Setting aside the disqualification of 20 AAP MLAs, the Delhi High Court Friday said the Election Commission recommendation in the office-of-profit case was “bad in law”, “vitiated” and failed to “comply with the principles of natural justice”. Setting aside the disqualification of 20 AAP MLAs, the Delhi High Court Friday said the Election Commission recommendation in the office-of-profit case was “bad in law”, “vitiated” and failed to “comply with the principles of natural justice”. The High Court directed the EC to hear the matter afresh and also decide the “all important and seminal issue” of what is meant by “office-of-profit in government”. 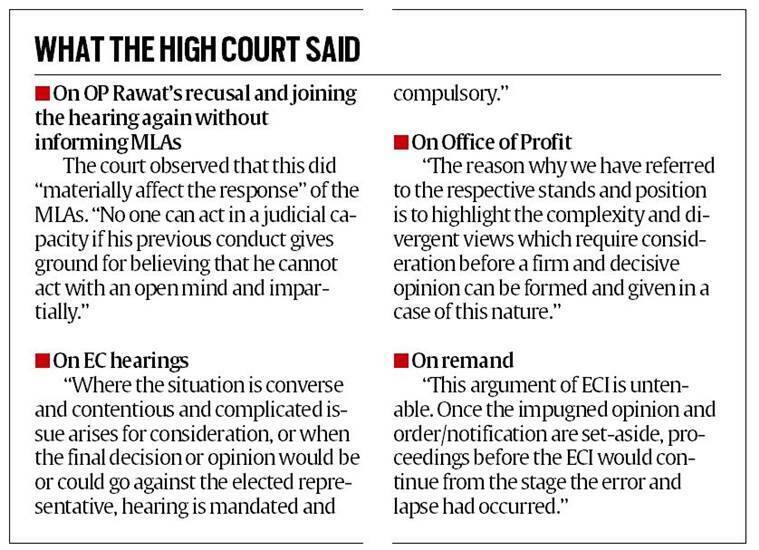 In a 79-page order, a bench of Justices Sanjiv Khanna and Chander Shekhar said the January 19 opinion of the EC — that disqualified the 20 MLAs — was “vitiated” as the EC had not given the MLAs a hearing and remanded the plea back to the EC. 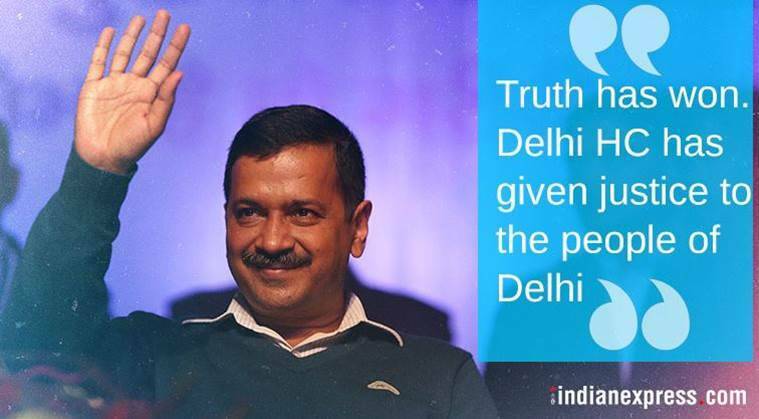 With the order effectively reinstating the legislators, Delhi Chief Minister Arvind Kejriwal said it was a “victory of truth” while Assembly Speaker Ram Niwas Goel said that he would now allow the 20 MLAs to attend the ongoing budget session. Express Explained | What is the office-of-profit case? The 20 MLAs had been appointed parliamentary secretaries to ministers in the Delhi government in March 2015, after the AAP’s stunning victory in the assembly elections. In September 2016, the Delhi High Court had ruled against this appointment. On January 20, President Ram Nath Kovind, on the EC’s recommendation, had disqualified all 20 for holding an office-of-profit. The Delhi High Court, on January 24, had refused to stay the notification disqualifying the legislators but had restrained the EC from taking “precipitate measures” such as announcing poll dates. Chief Election Commissioner, OP Rawat had recused himself from cases related to the AAP after Kejriwal had questioned his independence on April 20 last year, when Rawat was an Election Commissioner. Rawat agreed to rejoin the proceedings on September 22, 2017, without informing the AAP. Arora had signed the January 19 recommendation to disqualify the MLAs. AAP spokesperson Saurabh Bhardwaj alleged that the disqualification was recommended to “please the Centre”. “ In the entire country, it will be a big thing for small parties that the conspiracies of Centre, which is drunk on arrogance and is trying to crush them, can stop,” he said.